This year may have been one of the most challenging I've ever experienced, but it will always hold a very special place in my heart. Never again will I experience the utter cluelessness of being a first time mom or the exhilaration of watching my baby experience so many "firsts." I saw my firstborn turn from a little baby to a walking (running! ), talking amazing little boy. 2010, you will be fondly remembered. Happy New Year's! What are your plans for this evening? The magic of Christmas, long dulled by the realities of adulthood, returned for me this year. I haven't been filled with this level of anticipation on Christmas Eve in a long time. While Nate is still too little to understand that Santa is coming, he certainly does appreciate new toys and new experiences. Wrapping all of the presents we had hidden away while we watched It's a Wonderful Life and The Bishop's Wife , planning the video angle and method in which we would reveal the mountain of treasures and then imagining Nate's reaction to the pile of boxes made for a very special Christmas Eve. I know it will only get better in the years to come (until some bratty school friend drops the bomb that Santa doesn't actually operate an elven sweatshop up north) as Nate gets older and understands the full meaning of Christmas (you know, the important stuff, like good behavior is rewarded with monetary gifts and it's okay to gorge on cookies at certain times of the year). I know I already mentioned the rocker, but I'm so psyched he likes it, I have to mention it again. It was the big gift from Santa, first present to be opened and first to be summarily rejected. "NO." I'm glad Nate gave it a second chance. It's the perfect size for his little legs and he can rock away all by himself yelling "GO!" without fear of falling off. And as I mentioned to Glamamom, the Rainbow song has become our family anthem. Daddy picked out this P.D. Eastman book since he remembered it so fondly from his own childhood. It is a huge hit. While the book is one of the longest in his collection at sixty-four pages, that doesn't prevent Nate from sitting through the entire story and then asking to read it again. And again. And of course, Nate can yell "GO!" over and over again. So it's a win-win for Nate and the parent reading the book. After learning that Playmobil toys are made with a safer plastic (bpa, pvc and phthalate free), my parents got Nate this very cool set. There are tons of little people that bend (and their heads spin around Exorcist style too! ), vehicles to drive, and of course the animals and their accessories. Nate likes moving the little pieces around from one place to another and I think this will really grow with him too. What were the big hits from your holiday? Baby sign language is great for helping to teach more difficult, abstract concepts. HELP and HURT are two great signs for a child to know. They can also help keep your toddler safe safer and even solve medical mysteries. For example, the baby sign language instructor at our library told us a story about a toddler who used sign language to tell her mother that her nose hurt. After some investigation, it turned out that she had stuck a small bead up her nose and it was stuck. If the baby had not known sign language the bead would probably have traveled up her sinuses and into her brain. Or busted out her tear duct...or, er something awful like that. Actually a very special person in my life (who shall remain nameless) stuck a bead up her nose when she was two (weirdo) and it eventually dislodged itself after a lot of running around. But still, it's a cool story. How else would the mom of the signing baby have known about the bead? I was thrilled when Nate started using HURT and HELP over the last week. He used HURT (click here for the ASL sign) to tell me that his mouth hurt, which made sense since he just cut two molars and it looks like his bottom canines aren't far behind. He uses HELP in a less sad spoon context - to ask me to get a toy he couldn't reach. The ASL sign for HELP is fairly difficult for little kids to make (click here for the sign), so most baby sign language books and instructors suggest a more kid friendly version - patting your upper chest with both hands. If your child doesn't fall down constantly like mine (giving me plenty of opportunities to sign HURT), you can always act it out with a teddy bear. "Oh, boom! The teddy bear fell and HURT his head. Poor teddy bear. It looks like he needs a band-aid for his boo-boo." As I've mentioned before, I've been desperate for some new material. Nate's been sick (and cutting molars) so he's been napping less. Ordinarily we'd fill those extra hours outside, but it's just been too cold here. And I'd take him to an open play somewhere, but his nose has just been too runny. The games we used to play just don't seem to be cutting it anymore. Nate would rather run around the house exploring all of the super non-baby proofed areas. So I've needed to be more creative, but just haven't had the inspiration. We have managed to spend quite a bit of time with our new drawer game. I filled a bottom dresser drawer with Nate's summer clothes. He loves opening the drawer, emptying the contents and then cleaning up. (I don't know where that boy got his cleaning gene.) And when that stopped being incredibly exciting, we started dressing all of his stuffed animals in those clothes. The special ones also got diapers. Yesterday we went to the library and picked up a bunch of books that are going to solve all of my problems - at least that's what the cover of one of the sleep books says. We also got Games to Play with Toddlers by Jackie Silberg. It is fantastic. There are so many great ideas in there. I think I'm going to have to buy it. I highly recommend it. A game that we played straight from the book involved turning old wooden spoons into puppets. You take a marker and draw a happy face on one and a sad face on the other. Then you have the happy face spoon talk about happy things, in a cheerful voice ("Yay, I'm so happy! I love playing with Nate!") and the sad face talk about sad things ("I'm sad because I got a boo-boo. And I have to pay taxes and student loans. Waaa, waaa. I'm crying. Cemeteries. Nursing homes.") Well, okay, that's not an exact transcript, but you get the idea. It's a great tool for teaching emotions. Nate really liked it and seemed to be getting the concepts. And I felt good because I was teaching him something and it wasn't the same old, same old boring stuff. 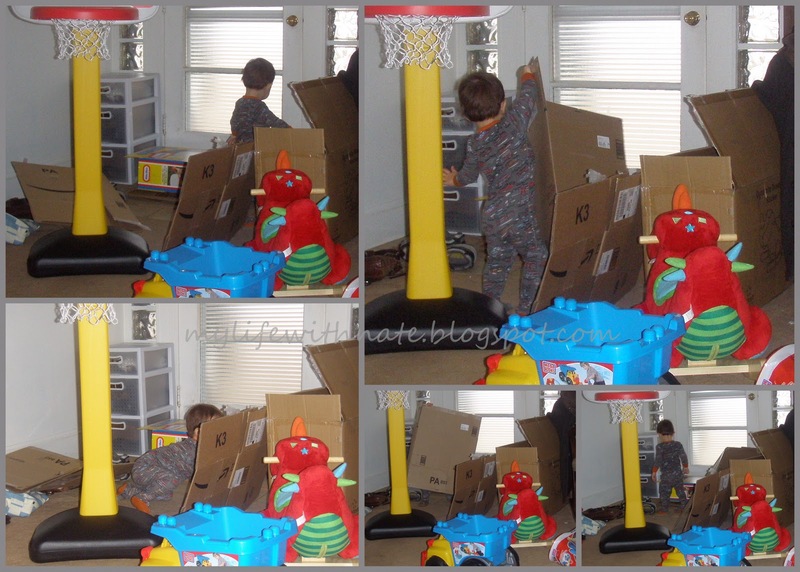 What games do you play with your toddler? Share! I've discovered that it's more difficult to find non-toxic toys for Nate as he grows older. Part of the problem is that the stores I trust for non-toxic items, like The Soft Landing, tend to have more to offer smaller babies. So I have to do a lot of new research to determine which toys would be good choices, and I just haven't had the time. Another problem is that Nate is opinionated now. He likes big plastic trucks, shiny plastic blocks and fun plastic ride-on toys. I like to find wooden alternatives when I can (Plan Toys has tons of great stuff), but when you're buying more than one toy at a time, that can really become expensive. So I was thrilled to read a post from ZRecommends and discover that Playmobil toys are made of ABS plastic and are BPA, pvc and phthalate free. They have tons of cute sets for toddlers, like the Playmobil Push and Pull Train Set we're getting Nate for Christmas. I also love the PLAYMOBIL® 1.2.3 Truck with Garage and the Playmobil 1.2.3 Large Zoo . I've updated my Non-Toxic Toy Guide to include some Playmobil toys. Check it out if, like me, you're still shopping and need inspiration. Most of the 1.2.3 sets are recommended for children ages 18-36 months. Are you done shopping? What's left on your list? When Nate was eleven months old, I joked about potty training him successfully (due to some unusual bath time activity). At sixteen months, it still seems far enough away that I haven't really read anything about toilet training, other than quick blurbs in some baby books. I think they (the blurbs) all focused a lot on the timing. Start too early or too late and they'll never be trained. They'll never date and they'll live in your basement for the rest of their lives. Something like that. I'm sure we're still a long way off. But I'm happy for first steps. In the meantime, I need to read up on potty training so that I am prepared when the time comes. Any recommendations? I've also seen ads for baby signing programs geared towards potty training, like Potty Training (Baby Signs). I've been meaning to learn new signs anyway, so I think I'll put some bathroom signs on my to-do list. This past month whipped by at lightening speed. But at the same time it feels like ages ago that we visited our family for a four night stay over Thanksgiving. It seems that every time we travel you come home with a whole new set of tricks and all the predictability in our routines fly out the car window. This trip was no exception. You now play a number of games with us. Some of them are just designed to torture mommy. Favorites include pretending to throw food from the high chair and/or putting it in your hair while you smile, waiting for me to tell you to eat the food instead. You also enjoy trying to (and often succeeding in) taking gulps of your bath water. You laugh like a maniac when I tell you "stop, it's disgusting!" And of course you love the classic toddler favorite where you run from forbidden thing to forbidden thing, testing your limits. Other games are much more fun for all. When we say "Go, Nate, go!" you yell loudly, "GO!" in the cutest little voice while you run across the room. We really have to get that on video. When I sing "Old MacDonald" to you I pause so that you can fill in the animal. You proudly say "duck!" almost every time. Occasionally the farm will be lucky enough to also include a "gaht" (cat). Like any toddler, you love repeating things ad nauseum. But you seem to accept the end is near when we tell you "one more time, and then we're all done." You now hold up that one finger for "one more time." It's totally adorable. You and your daddy invent new games all of the time. I love watching you two together. It's already so obvious that you think he's the coolest thing on earth (well, other than Elmo). Daddy does crazy, fun stuff with you that I would never think of and you love every second of it. He makes you laugh so hard on a regular basis that you scream. We're so lucky to have you, but you are also so lucky to have him for a daddy. You continue to pick up new signs. The newest ones include SLEEP, FROG and DINOSAUR. There are very few signs that I show you that you don't imitate or at least try to imitate. Your ability to learn new signs seems to only be capped by my ability to teach you. I need to learn more and I haven't made that a priority. Perhaps it's because you seem to understand just about everything I say anyway. But it's on my to-do list. Your current favorite activities include coloring/drawing (which you call "dudu") and playing in a dresser drawer in which I have put your summer clothes. I've also recently discovered that you like to clean and are content to wipe various surfaces in our home with a paper towel. Keeping you entertained in our home has been a challenge, especially with the weather turning cold and a nose much too runny for open plays or the library play room. I need some new material! Your sleep has been totally wacky. You were sick (allergies), then we traveled, then you got a cold. So I don't know how much all of that is to blame. It could be that things are just changing. Also, I wrote a blog post about our lovely bedtime routine and how well it was working, so clearly that jinxed things. You now may or may not nurse before bed. I'm hoping that you're weaning yourself and that will last after your cold goes away. But you also now won't just lay down and go to sleep. It's been different every night this week. A few nights I had to sing hundreds of verses of "Wheels on the Bus," one night I had to rub your back and tell you about all of the things in the world that were going to sleep. Tonight I just had to sit by your crib until you fell asleep. But you continue to wake up frequently throughout the night. Naps are a complete mess and I am once again at a total loss. Ferber just hasn't worked for us and we need a new plan. Sweetpea, you can be really exhausting! Mommy needs breaks, you know! But as exhausting as you can be, I love staying home with you. I love teaching you things and watching you develop from day to day. I know I am so lucky that I've been able to stay home with you this long and I'm not looking forward to that changing. But I know we'll make it work when the time comes. Especially if you keep those hugs coming. You're such a snuggle monkey. To see the ASL sign for CARROT, click here. Have a great weekend! Any fun plans? Guess what. I got an award! My blogging buddy Ashley from Ashley...plus three has passed on the Stylish Blogger award to me. She claims she only aspires to be stylish, but I think she's already achieved her goal. She's the west coast mom of two little ones, takes gorgeous photographs and cooks amazing looking meals. If you haven't stopped by Ashley's blog, you should! As an army brat, I attending two elementary schools, three middle schools and three high schools. As an undergrad I went to two different colleges...because it wouldn't be right to complete my education in just one place. I applied to and enrolled in a law school I had never visited. I didn't care what it was like. I just wanted to live in NYC. I rescued my dog Ava from a neglect/abuse situation on a whim over seven years ago. I heard a fellow student talking about a rottweiler pup in trouble and decided to take her that very day. I lived in a "no pets allowed" studio. Because she's an, um...high maintenance dog, she has effected everything...where I live, when and where we travel, even who I dated. I've never regretted adopting her. I remember the exact moment I saw my now-husband for the first time (like it was yesterday). I don't understand what everyone has against prunes. They're just dried plums. Sheesh. Labor was....labor. Seventeen hours. Bad reaction to the epidural. Not fun. But the instant Nate was put on my chest, I thought, "oh that wasn't so bad." My pinkie toenails are really weird. I won't go into details. It might be too much for you to take. And it's hereditary. I hope Nate doesn't inherit the curse. Hope you get the chance to visit them. Click here, here and here to see previous award winners. The best parts of any holiday, as far as I'm concerned, are the family traditions that go along with the day. And now that we have a son, it's even more fun to focus on those traditions. I want to carry on some from the past as well as introduce some new ones unique to our nuclear family. We celebrate Christmas and we started the festivities this past weekend. We have an ugly little fake tree that we've put up for the past two or three years. I prefer real trees, but we don't need Nate pulling down a big, live tree on top of himself. It's enough work to keep Nate's hands off the little one. The tree itself may be ugly (I think it may have a total of seven branches), but I love our ornaments. My favorites include the ornaments my grandmother and great-aunt gave me every year as a child, the beaded ones my great-grandmother (Nana) made by hand and the simple wooden ones my mom painted when I was a baby. I love seeing the dates on the older ornaments (my first Christmas was 1978) and I want to make sure Nate gets a dated ornament every year. It would be so cool to see them hanging on his own tree one day. In addition to the beaded ornaments, my Nana made other ornaments as well. My sister and I each have a small mailbox ornament that hangs on our parent's tree. To this day Santa continues to leave very generous gifts inside each of the mailboxes. My sis came up with the great idea to get more mailbox ornaments so that our children can have that tradition as well. I haven't looked for any yet, but I know she's having trouble finding anything similar. So the hunt is on for some mailboxes! My mom always makes the most delicious thumbprint cookies around Christmas. I'm so going to miss them this year. Hmmm...I wonder if they would mail well (hint, hint). I love cookies, so the tradition of making them for Christmas is definitely going to be carried on. To start things off, Nate and I made sugar cookies this weekend. But you know, we're sick with colds. We washed our hands, but I don't thing anyone else should be eating them. Plus, I'm not going to lie. The cookie cutters were thrown on the floor many, many times. I could only wash those things so many times. That's my excuse anyway - "But I had to eat them all myself! They have cooties." What are some of your holiday traditions? Oh, and I keep forgetting to wish everyone a Happy Hanukkah! The coolest thing just happened as I was putting Natey to bed. We went through our normal bedtime routine and it was going well despite the fact that Nate finally caught my nasty cold. Tonight I chose Goodnight Moon for our bedtime story, because it's one of Nate's favorites and I needed to make sure he stayed a happy camper before bed. He's been going through a phase for the last week where he won't let me finish the book at bedtime. Instead, he takes it and looks through the pages himself while he sits on my lap. I generally don't tolerate such behavior and usually give him a time out (using the one minute per each year of life rule). But as I was feeling generous tonight, I talked about each page while he flipped through. He pointed to objects he wanted me to label and he signed the words he knows. Goodnight Moon is a great book for signing. The signs we use include MOON, FIRE (in the fireplace), HOT (the fire), CAT, COW, BEAR, MOUSE, LIGHT, STARS and SLEEP. Admittedly, I don't sign the signs for bedtime (like SLEEP, TIRED, etc.) as much as I should - especially given our perpetual sleep difficulties. So it really surprised me when I told Nate that the bunny was sleeping (without also signing it) on the last page and Nate signed SLEEP for the first time. (I actually use the ASL sign for BED to mean sleep, sleepy, asleep and going to bed.) Nate made the sign by putting a palm on each of his cheeks and it was adorable. And just like that, Goodnight Moon seemed to really click for Nate. He understood that the boy was sleepy and going to bed with his pillow and blanket - just like the pillow and blanket Nate has in his crib. And Nate began pointing at random objects in his room, wanting to tell them "goodnight." Nate has always enjoyed labeling the objects in the book, but he suddenly seemed to be understanding the story. I took the opportunity to point out that the mama (I think the "old woman" might actually be the grandmother, but for our purposes she was the mama) sat in the room with the bunny boy, but then they turned out the light and it was time to go to sleep. Nate understood and didn't complain too much when it was time for our light to go out. I hope you realize I was totally kidding about the time out thing. We use ten minutes of time out for every year of life.